We take this opportunity to congratulate Dr. T.N. Dharmadhikari the former Director of Vaidika Samshodhana Mandala (Adarsha Sanskrit Shodha Samstha) Pune for this Scholarly study which is really unique of its own. The mairayani Sakha has lost its oral as well as the ritual tradition. To add the situation the scholars the critics and the commentators have turned their face away from this subject. This critical and comprehensive study of the Matiryani Samhita will certainly fulfil this lacunae. Originally this is the work Dr. Dharmadhikari had submitted as his doctoral thesis to the University of the Pune. We really feel proud that he accepted our request and allowed us to publish his work for which we will remain grateful to him for ever. We are really thankful to following institutions and persons for extending their help in bringing out his work. The authorities of University of Pune for granding the permission for publication of work. The Rashtriya Sanskrit Samthana New Delhi for Substantially funding the printing of this book. We also sincerely extend out thanks to the trustees of the late Prof. Shankar Yadav Ponkshe educational trust Pune for their financial Assistance. We sincerely thank Prof. Dr. Madhav Deshpande of University of Michigan U.S.A. who Donated Rs. 10,000/- in memory of his father late Shir Murlidhar Vasudeav Deshpande. Out thanks are also due to Dr. Bhagayashree Bhagwat and Mr. and Mrs. Paranjape of the Vaidika Samshodhana Mandala (Adarsha Sanskrit Shodha Samstha). Similarly Dr. Mrs. Suneeti Dubley, Dr. Mrs. Jayashree Sathe and Dr. Mrs. Nirmala Kulkarni also deserve out thanks for their sincerely and meticulously going through the proofs. We sincerely thank Ms. Ketaki Gokhale for carefully perfectly and speedily doing the computerized type setting and preparing ready the press copy of this work and also Ms. Vaijanti Dhole Patil and Ms. Surekha Wagle of step in Services, Pune for Printing the work in time. 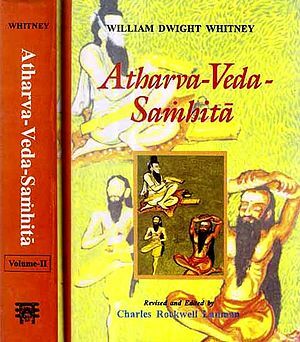 Early in 1958, when I had the privilege to associate myself with the project of critically editing the commentaries of Bhatta Bhaskara and Sayanacarya on the Taittiriya Samhita, undertaken by the Vaidika Sarhsodhana Mandala, Pune, I was attracted towards the study of the Vedic Rituals. Dr. Kashikar, the then Secretary of the Vaidika Samsodhana Mandala, and the Editor—in-chief of the Srauta—kosa, suggested to me to undertake the study of the Maitrayani Samhita, which was not made so far a subject of detailed study, especially from the point of view of ritual. It was, however, only in 1961 that l could undertake this study as a dissertation for the Ph. D. degree of the Poona University. 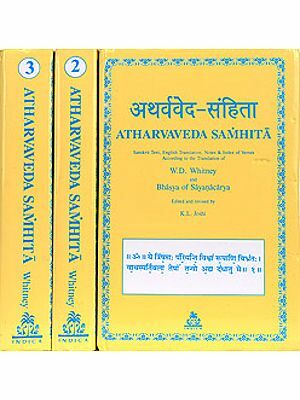 The present work is divided into four parts : viz.1) Introduction, 2) The ritualistic synopsis of the contents of the Maitrayani Samhita, 3) Linguistic peculiarities, and 4) Appendices. 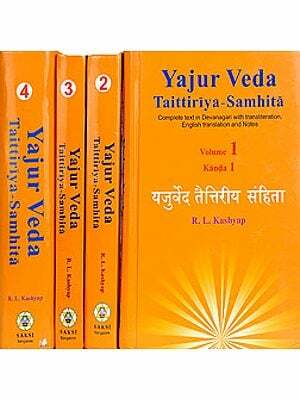 In the Introduction, I have discussed themes like 1) The place of the Maitrayani Samhita among the Schools of the Yajurveda, 2) The Maitrayaniyas and the Kalapakas, 3) Causes of the decline of the Maitrayaniyas, and 4) The critical investigation into the arrangement and the contents of the Maitrayani Sarhhita. The second chapter is devoted to the ritualistic analysis of every anuvaka of the Maitrayani Samhita. 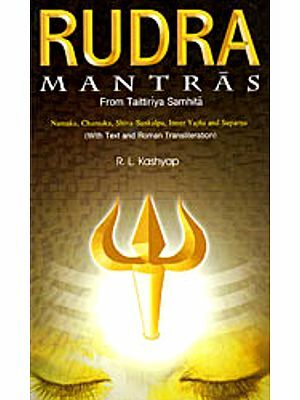 Of the mantra portion, the viniyoga of each Yajus or Rk formulas (or of a group of Yajus or Rk formulas) is briefly stated. Of the brahama portion, the ritual prescribed by the vidhi sentences is fully explained. The ritual suggested by the arthavada or by a reference to the mantras is also pointed out, where necessary, with a view to making the ritualistic interpretation more intelligible. 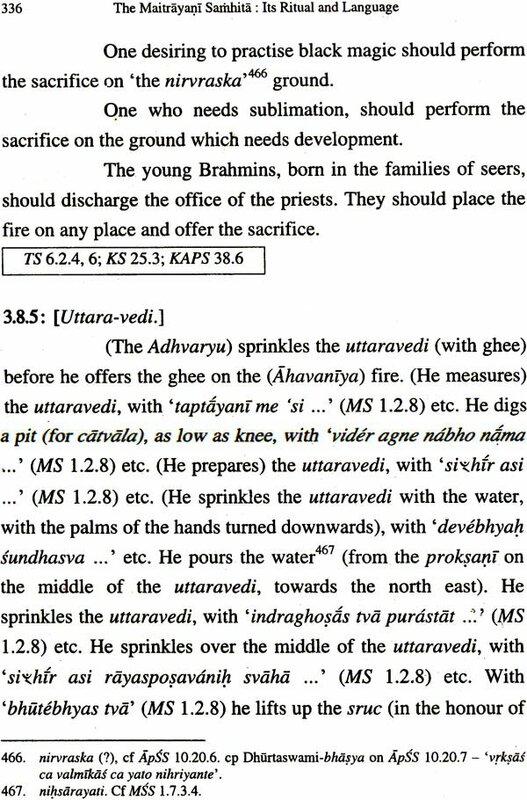 The order of A the vidhi sentences, in some cases, had to be adjusted to suit the sequence of the ritual. 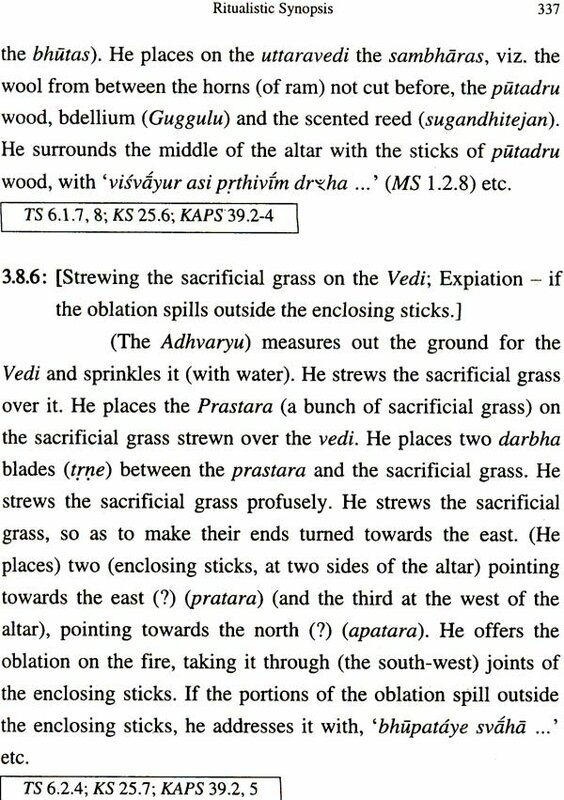 I hope this ritualistic analysis will help The Vedic Scholars to understand the rituals as reflected in this Samhita, in a better way, in absence of any traditional commentary on it, and in absence of its translation in any language. The third chapter covers the peculiarities regarding1) Phonetics, 2) Morphology, 3) Syntax, and 4) Lexicography In the end are given four appendices viz. those 0n1) Accentuation, 2) The Maitrayani Samhita and Panini, 3) The Etymological speculations in the Maitrayani Samhita, and 4) Some conjectural emendations to the text of the Maitrayani Sarnhita. Before I conclude, I record my sense of gratitude to my Guide Dr. M. A. Mehendale, who gave me valuable advice and guidance and enabled me to complete this dissertation. I am also indebted to Late Dr. C. G. Kashikar for suggesting to me this interesting subject for my Ph. D. studies. I also thank Late Dr. V. V. Bhide, with whom I discussed some intricate points of ritual. I am indebted to Prof. M. Mayrhofer of Vienna University (Austria) for making available to me the photo-copy of ‘Das Kathakam und die Maitrayani Samhita, by Schroeder, published in Mon-B, Berlin 1879,pp. 675-704. I must also express my thanks to the University Grants Commission for awarding me a Research Fellowship for two and a half years. This helped me to devote more time to my research and complete the work expeditiously. My sincere thanks are due to the Librarians of Deccan College, Vaidika Samsodhana Mandala, Bhandarkar Oriental Research Institute, and Fergusson College, who readily made available to me theb ooks and manuscripts required for my work. I am glad to extend my heart-felt thanks to the authorities of the University of Pune, for granting permission to publish this thesis, vide their letter No. 916 dated the l8th Feb. 08. I also heartily thank Dr. Mrs. B. A. Pataskar, The Director and the Secretary of the Adarsa Samskrita Sodha Samstha - Vaidika Samsodhana Mandala Pune, for undertaking this thesis for publication and making arrangements for proof corrections.